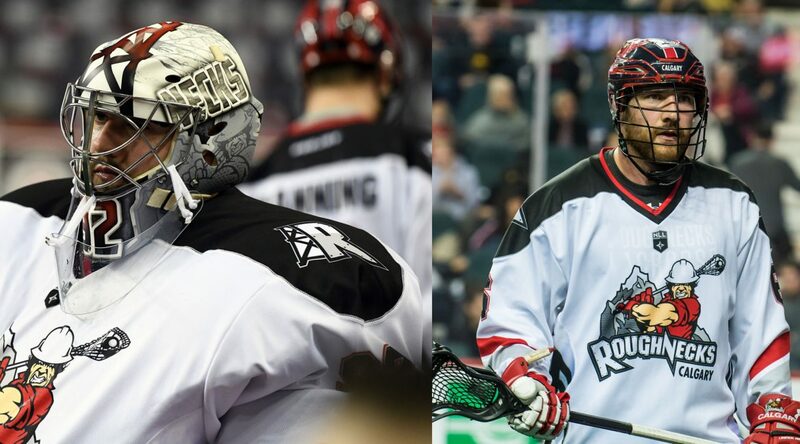 Calgary, AB – The Calgary Roughnecks today announced that goalie Frank Scigliano and defence/transition player Garrett McIntosh have been claimed by the San Diego Seals in the 2018 National Lacrosse League Expansion Draft. Scigliano, selected by the Seals in the sixth round, 12th overall, has played seven seasons with the Roughnecks after joining the team in the 2011 NLL Entry Draft. Throughout his NLL career, the 26-year-old Coquitlam, BC native has played over 2700 minutes, picking up 21 wins with a 0.765 save percentage. He guided Calgary to the Western Final five times and helped lead the team to the Champions Cup Final in 2014. San Diego selected McIntosh in the seventh round, 14th overall. The 29-year-old defence/transition player joined the Roughnecks in the 2013 NLL Entry Draft. He played 71 games with Calgary, finishing the 2017-18 season with 12 points (6G, 6A) in 16 appearances and picked up a career high 50 loose balls. “Like all the current teams, we expected to lose two good players in the expansion draft, and we did. We would like to thank Frank Scigliano and Garrett McIntosh for all their efforts during their seasons as Roughnecks” said general manager Mike Board. “We will now concentrate on building our team for the upcoming season through free agency and the entry draft with the goal of winning a championship. We need to continue to build a fast, athletic team on both sides of the floor and we feel the upcoming draft has those types of players”. Roughnecks 2018-19 season tickets are now available for as low as $31/seat for adults and $23/seat for children and students (excludes applicable fees). Visit Ticketmaster or the Scotiabank Saddledome box office to join the Rough House party. Fans can also secure a seat online at CalgaryRoughnecks.com or by calling 1-855-985-5000.